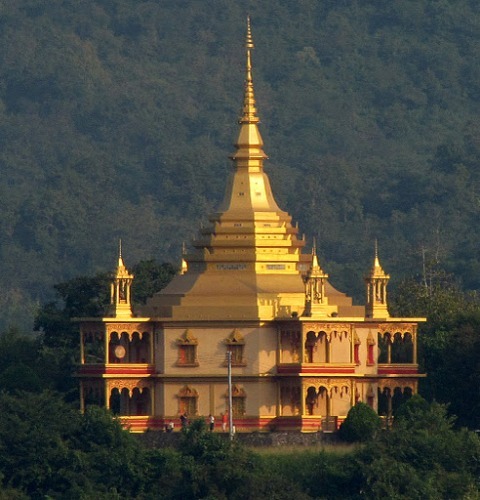 The Vipassana Temple and Park in Luang Prabang is a temple where monks meditate in the vipassana style. There are two kinds of meditations in Luang Prabang: the samantha and the vipassana. The samantha meditation focuses on the development of equilibrium and of concentration, while the main emphasis in vipassana meditation is on the development of inner contemplation and of intelligent insight. Meditation is important in Buddhism as it is believed to be the chief component in achieving enlightenment. It is regarded as a personal and private struggle towards escaping your pleasure-seeking self and transcending the agonies of life. It is an individualized effort where the person meditating shall be all alone with himself and his life experiences. It is in fact the most important exercise for monks, even though the practice is open to everyone. In Vipassana Temple, for example, you can see locals meditating. Some do it under the guidance of the monks while some do it on their own. And if you’re interested to learn it yourself while in Luang Prabang, you’ll find that there are abbots and meditation teachers who can teach you the principles of meditation and doing the exercise right. So when you go back home, you can practice meditation and even make it a part of your daily routine if you so wish. Meditation can be done in combination with fasting. In Luang Prabang, there are eight rules of fasting that they follow, and some also live in the monasteries for a period of time. Women also go to the temples to meditate. It is quite famous in Luang Prabang, especially as meditation is the only form of religious exercise available to women. The Vipassana Temple and Park is just one of the several temples in Luang Prabang where vipassana meditation is practiced. But of all, this temple is probably the most imposing one, with its gilded towers looming down below the street. The temple is also visible from the Phou Si Mountain. So, if you’re in Luang Prabang, consider visiting the temple. Learn more about meditation or just appreciate the interesting edifice. After all, the temples in Luang Prabang are among the reasons why the city was declared a World Heritage Site by the UNESCO. Just remember, though, that when you’re visiting a meditation temple, you should always observe silence and follow any rules the temple might have. How to get there: to get to the temple, take the Phetsarat Road from downtown Luang Prabang. Turn right just before the Nam Khan River bridge and go straight ahead. Travel down the unpaved road and continue on until you see the golden form of the temple. Visible from miles away, you won’t miss the Vipassana Temple.